On this day in history, Douglas Leo Beamish was convicted of second degree murder and sentenced to life imprisonment with 18 years of parole ineligibility in the Supreme Court of Prince Edward Island (Trial Division). Beamish, the estranged husband of Shirley Duguay, was the primary suspect in Shirley’s disappearance. When the body was found, the Royal Canadian Mounted Police (RCMP) found a leather jacket nearby covered in Duguay’s blood. Although Beamish’s friends and family acknowledged that Beamish owned a similar jacket, none would positively identify it. But in addition to the blood, investigators pulled two white hairs from the jacket. The hairs turned out to be not human but cat fur. 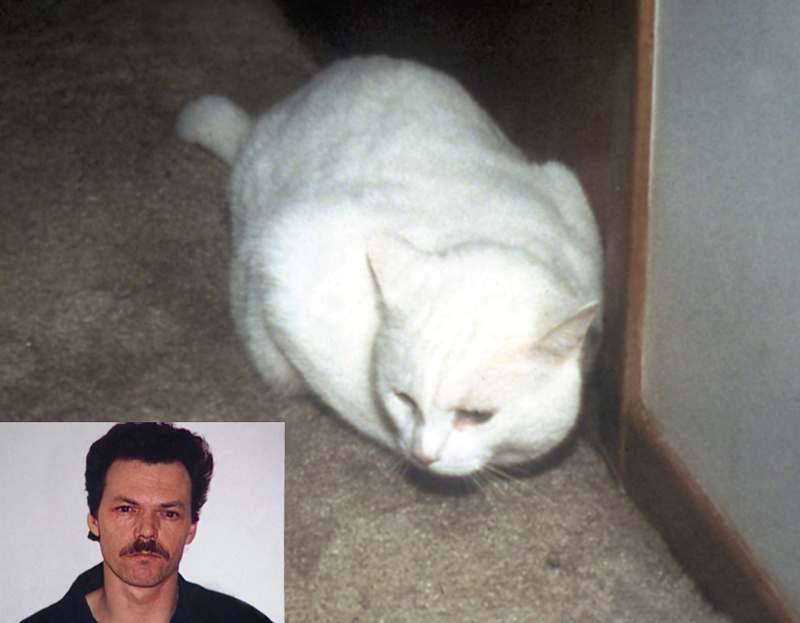 Detectives recalled that Beamish’s parents owned a white cat named Snowball and obtained a blood sample. (Beamish was at that time living with his parents.) Police inspector Roger Savoie could not find a Canadian laboratory to perform DNA analysis of the cat hairs, so he called experts in the U.S. and eventually reached Dr. Stephen J. O’Brien, chief of the Laboratory of Genomic Diversity at the National Cancer Institute in Frederick, Md., an expert on cats and their genes. He agreed to do the testing, analyzing the hairs in the jacket and Snowball’s blood. But even though they matched, Dr. O’Brien wondered if the cats on the island were so inbred that all of their DNA was essentially identical. He asked Detective Savoie to round up 20 cats in the neighborhood and send their blood too. To everyone’s relief (with the undoubted exception of Mr. Beamish), they found abundant genetic diversity among the cats. The introduction of Snowball’s hair as evidence was the world’s first use of non-human DNA in a criminal trial. Douglas Beamish was charged with first-degree murder and found guilty of second-degree. Beamish appealed his conviction in 1998 and 1999. Both appeals were rejected. Since this groundbreaking case, several prosecutors in the United States have presented in court forensic DNA evidence derived from animal samples.